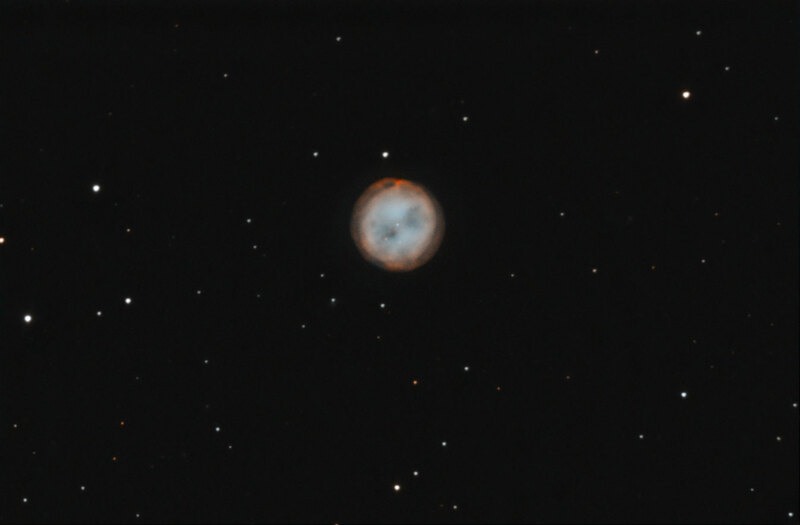 During a period of bright moon and clear skies I decided that the best thing to do was spend some time on the ultra bright planetary nebula, M97, NGC 3587, the Owl Nebula. During the first evening I captured 6 hours of data with my Skywatcher Newtonian telescope and the 6nm Astrodon Ha filter. The following evening was also clear with a bright moon so another 6 hours was invested with the 8nm Baader OIII filter. The combination of large integration times and a bright target makes for a very smooth result. I've put the Ha data into the red channel, and the OIII into the blue channel along with a synthetic green channel to make this colourful result.